Ironmongery Experts offer a selection of Bolts and Sockets, made with quality and durable materials for a long-lasting finish. Securing hardware and appliances is essential for both domestic and commercial establishments. We guarantee that all our products will give you a polished and stylish fitting. 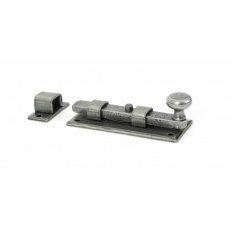 For example, our Black Japanned Garage Door Drop Bolt is a sleek and neatly designed model that will ensure a practical method to open and close doors or gates. Check out the Bright Zinc Plated Spring Chains bolt, this bolt emanates a traditional style whilst also maintaining the safe and secure product design you desire. At Ironmongery Experts we provide an extensive selection of Mortice and Hinge bolts. All our designs are made using high quality materials like steel or zinc. Whether you need a garden shed to be safely secured or a window to be properly fitted, we have a rafter of relevant products that will help you get your jobs done. To provide a secure fitting for your kitchen cupboards and drawers, view our Magnetic Catches. We also supply a selection of decorative keyhole Escutcheons used to conceal and protect your keyhole. We have a range of fun and dynamic Cupboard Knobs and Handles, which will add a touch of colour and character to your draws and cupboard households or work places.